Tuesday marks the Allman Brothers Band’s 50th anniversary and the launch of the Allman Betts Band featuring Devon Allman, Sarasota native Duane Betts and Venice resident Berry Duane Oakley. Los Angeles, CA (December 13, 2018) – It’s a beautiful March afternoon and Dickey Betts — longtime lead guitarist, songwriter and singer in the Allman Brothers Band — enjoys a cup of coffee at home on Little Sarasota Bay while discussing the legendary group he co-founded 50 years ago. Stories from the past are generously shared but the one topic he really sounds excited about involves a new band that will soon hit the road with the those iconic ABB initials. To coincide with the milestone anniversary, the Allman Betts Band featuring second-generation standouts Devon Allman, Dickey’s son Duane Betts and Berry Duane Oakley will launch a worldwide tour Wednesday. Their debut LP “Down to the River” will be released in the summer. Betts, who turned 75 in December, says he’s feeling OK today. It’s been an eventful past year, to say the least. 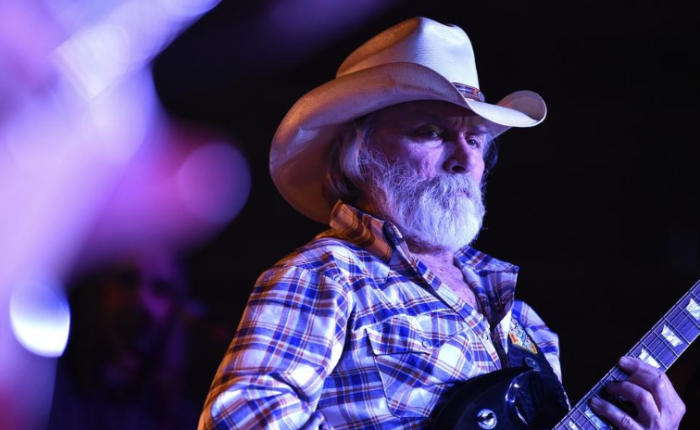 He started touring again last spring with his Dickey Betts Band. Then, an accident occurred here in September that required brain surgery. Anyone familiar with the man’s life and career knows better than to ever count out Dickey Betts. Duane and sibling Gregg Allman grew up in Daytona while the Betts family has ties to Sarasota-Bradenton dating back to about the time of the Civil War. After years of playing in various bands in many of the same Florida clubs, the Allman Brothers Band came together in Jacksonville with guitarists Duane Allman and Dickey Betts jamming with bassist Berry Oakley and drummers Jai Johanny Johanson (later known as Jaimoe) and Butch Trucks. Betts remembers how he and the rest of the musicians pleaded with Duane to get Gregg, who was in California at the time, in their new band. “Yeah, Duane and his brother were having an argument and Duane didn’t want Gregg,” Betts recalls. “We had five of us, and Duane was singing and there was me singing and Berry Oakley singing but we were guitar players; we weren’t really singers. We knew Gregg and we kept trying to get Duane to call him. Gregg Allman sang the band’s arrangement of “Trouble No More,” pretty much exactly as they would on record and then in concert for decades, on March 26, 1969, the birth date of the Allman Brothers Band. Following the release of their landmark 1971 live album “At Fillmore East,” lead guitarist Duane Allman and then bassist Oakley died in separate motorcycle accidents. The Allman Brothers’ ’73 LP “Brothers and Sisters” featured the No. 1 hit “Ramblin’” Man” and propelled the band to superstardom but then they split several years later. The Allman Brothers Band reformed in ’78 and then broke up again in ’82. After spending the better part of the 1980s living in the Sarasota area while relegated to playing clubs and bars with their respective solo groups, Gregg Allman and Dickey Betts did it: They resurrected The Allman Brothers Band — again. The bestselling 1989 “Dreams” box set and subsequent albums of new material starting with “Seven Turns” put the Allman Brothers back on top. By the early 1990s, they were headlining 10,000- and 20,000-capacity venues across the country. Older songs played regularly on classic rock radio while new singles including “Good Clean Fun,” “End of the Line” and “No One to Run With” were heard on mainstream rock stations with their music videos appearing on MTV. In ’95, the Allman Brothers were inducted into the Rock and Roll Hall of Fame. The Allman Brothers’ summer tours of the era were family affairs with Betts initiating a tradition of bringing their sons on stage. Berry Duane Oakley, who’s slightly older than Devon Allman and a few years older than Duane Betts, made his debut with the Allman Brothers Band on Aug. 11, 1989, at Shoreline Amphitheater near San Francisco. At one Allman Brothers show in the 1990s, Betts crouches behind his stack of Marshall amplifiers during a drum solo. He spots Devon Allman watching from the side of the stage and motions over to him. Devon asks if can get him anything. Betts points to the cheering crowd and tells Devon to look out there. “Someday that’s going to be you and Duane’s crowd,” Betts says. It’s a fond memory of Devon’s. The Allman Betts Band — featuring Devon Allman and Duane Betts on lead guitars and vocals with Berry Oakley Jr. on bass — will kick off its inaugural world tour at The Brooklyn Bowl in New York City on Wednesday. The shows will feature new music from the upcoming debut album “Down to the River,” recorded at Muscle Shoals Sound Studio, as well as classic Allman Brothers songs in honor of the band’s 50th anniversary. It’s a special bond shared by Devon, Duane and Berry, who have known each other since meeting as kids 30 years ago on the road with the Allman Brothers Band. In 2000, Betts left the Allman Brothers Band in a much-publicized split after reportedly being told by fax to “get clean.” The Allman Brothers continued touring for another 14 years but only released one more studio album. Betts also released another studio album of new material and toured with his Great Southern group, which would feature his son Duane sharing lead guitar duties with him. Dickey Betts decided to retire in 2014 following a hometown charity show here at Robarts Arena that took place shortly after the Allman Brothers Band’s final gig. In January 2017, Butch Trucks died of a self-inflicted gunshot wound. A few months later, Gregg Allman died due to complications from liver cancer. Gregg Allman kept his health problems private but Dickey Betts had been informed and recalls calling him quite a bit during those last months when Allman was frequently in and out of the hospital. Betts has praised Gregg as the best white blues singer and as having a “golden voice.” When they spoke, though, Betts couldn’t help but be saddened to hear that great voice reduced to a whisper. Dickey and Duane Betts were with Devon Allman, Berry Oakley Jr. and many more members of the extended Allman Brothers family at Gregg Allman’s funeral in Macon, Georgia, where the Allman Brothers were based in the early 1970s. Former President Jimmy Carter, whose election the Allman Brothers Band boosted, attended the private ceremony along with Allman’s ex-wife Cher. Gregg Allman was buried near his brother, Duane, and bandmate Berry Oakley. Betts told a reporter from Rolling Stone he was retired for a story that ran in November of 2017 but soon changed his mind. On his birthday, Dec., 12, 2017, after about a four-year hiatus from performing, Dickey Betts announced he would play select dates in 2018. And then there was the accident at the Betts home, followed by a huge outpouring of support from fans all over the world as Dickey went into surgery. “I wasn’t worried about it too much; everybody else was, of course, but I was too loaded on Propofol there for about four or five days,” Betts says with a chuckle. “From that stroke, I was taking blood thinners so they had to put me in an induced coma. I was just in a dream world, thought I was in a cowboy movie, and when I came to I was just glad to be awake and see somebody. During a New Year’s Eve show by the Devon Allman Project featuring Duane Betts with special guest Berry Oakley Jr. at the Grand Opera House in in Macon, Dickey Betts sat right in front of Oakley’s amplifier and took it all in. Then, after the clock struck midnight, Betts stepped onto the stage to play guitar on his revered instrumental “In Memory of Elizabeth Reed.” “It’s just such an honor and a privilege to be on stage with him,” says Devon, who makes a memorable appearance on the upcoming Dickey Betts Band CD/DVD. “You know, Dickey was the first one to invite me onto the Allman Brothers’ stage,” Devon says. “He heard me sing backstage and was like, ‘Man, I didn’t know you had pipes like that.’ He was always very supportive and, yeah, the first one to invite me on the Allman Brothers stage, even before my dad, which was pretty mind-blowing. While Dickey picks up the guitar occasionally, his only appearance on a public stage since the accident has been the one on New Year’s Eve. He has no concert dates booked for 2019.